In the aftermath of Irene, I know that there are a lot of folks in my state of Connecticut who are still without power and a lot (including my family in my hometown of Canterbury) who will continue to be without power until perhaps sometime next week or maybe even longer if the beleaguered workers of Connecticut Light & Power run into even more difficulty restoring the thousands and thousands of lines that were downed by the thousands and thousands of trees that fell as a result of Irene's passing. Needless to say, it's a mess. Even more of a mess, though, is the state of Vermont - a place that I have become rather fond of over the past few years as I've had occasion to travel up that way in search of covered bridges and historic inns. I've met some truly wonderful people up there that I consider to be friends and Amanda's friend Darci now attends school in Bennington. 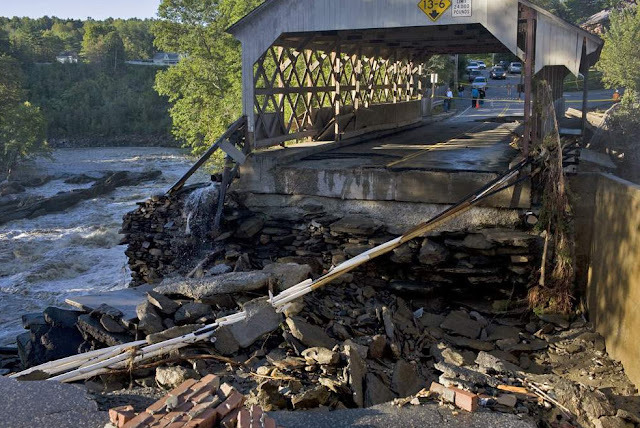 When I heard about the damage and devastation that was wrought by Irene in their area, it broke my heart and every time I see a picture like the one below, it breaks a little bit more. 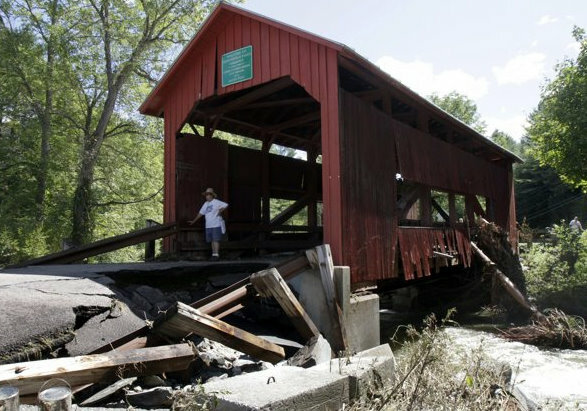 This is what's left of the Quechee Covered Bridge which was on Route 4 and the principal entry to Quechee Village. 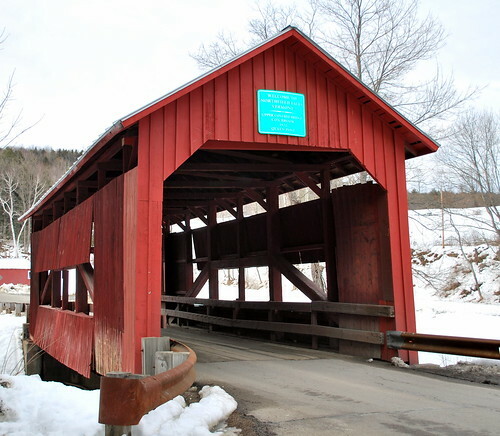 Even though it was built in 1970 as the fourth bridge to provide passage across the Ottauquechee River and it is not an authentic covered bridge, it often appears in tourist literature for the area and at 35'-1" wide, it was the widest non-authentic covered motor vehicle bridge in Vermont. It now hangs by barely a thread and it's unsure as to whether or not it can be saved. 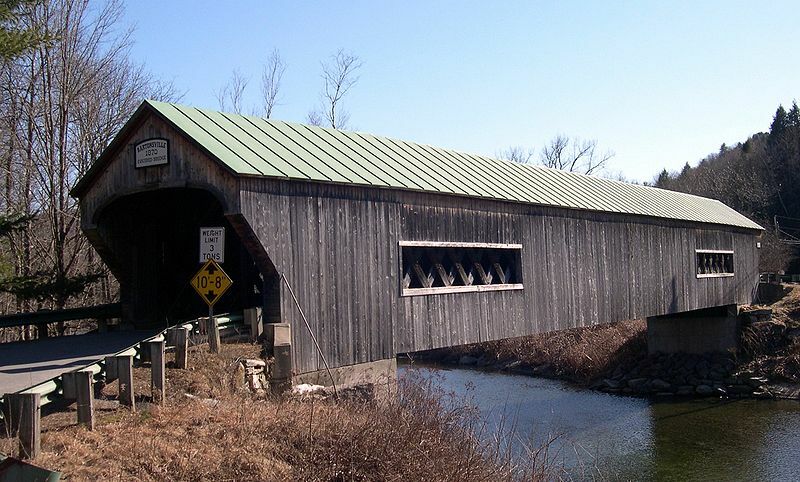 Built in 1870 by Sanford Granger, the bridge was a lattice truss style with a 151-foot span that was built after the the Great Flood of 1869 changed the course of the river replacing another covered bridge about a quarter of a mile up the road where the river used to flow. The Bartonsville Bridge was listed on the National Register of Historic Places and was on my "list" of bridges that I had hoped to get to but was ironically one that I had hoped to see on my list visit to Chester but ran out of time to get to. I am still kicking myself for that one but there's not much to be done about it now. 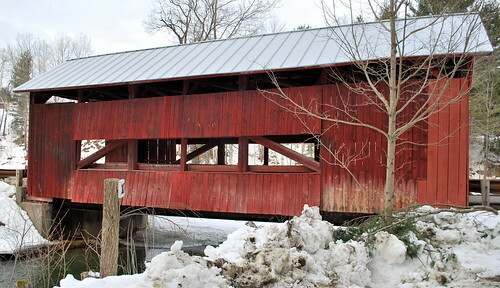 A third covered bridge, the historic 1872 Upper Cox Bridge in Northfield Falls was also damaged when the Cox Brook jumped its banks. This bridge is one of three that are located within a quarter of a mile of each other. The Upper Cox Bridge - aka the Third Bridge - is one of the historic covered bridges that I did see in person when I made my trip to Vermont in February of 2010 and luckily I've got a few pictures of my own. It's heartbreaking is what it is but in the midst of that heartbreak I've found a major admiration for the people of Vermont as they're not waiting around for the Federal Government to save them (or not as they case may be) but instead are rolling up their shirt sleeves and digging in to help each other out of the mess that Irene left behind. They aren't crying "Why me?" but instead are asking "What can I do to help?" I get the distinct feeling that when this is all said and done, Vermont is going to come out stronger than they were before Sunday, August 29th, 2011. If you're wondering what you can do to help the folks in Vermont as they put back together what Mother Nature took away, please consider making a donation to the Vermont Food Bank either by visiting their website or by texting the word 'FOODNOW' to 52000 to donate $10. You can also visit the Red Cross website for Vermont and the New Hampshire Valley and perhaps make a donation there if you're so inclined. Either way, I'm sure that those unknown folks that you help in Vermont would be quite grateful. I know that we all hurt from time to time but sometimes other people hurt more. I saw that video on TV, too. So sad to see any of the property damages and loss. The photo on Boston.com's The Big Picture of a father and daughter in NC sitting on their steps imagining that their house was still behind them as they watched the sunset did me in though. Ugh. Heartbreaking. srsly. This is sad indeed Linda. I know your love for these bridges. 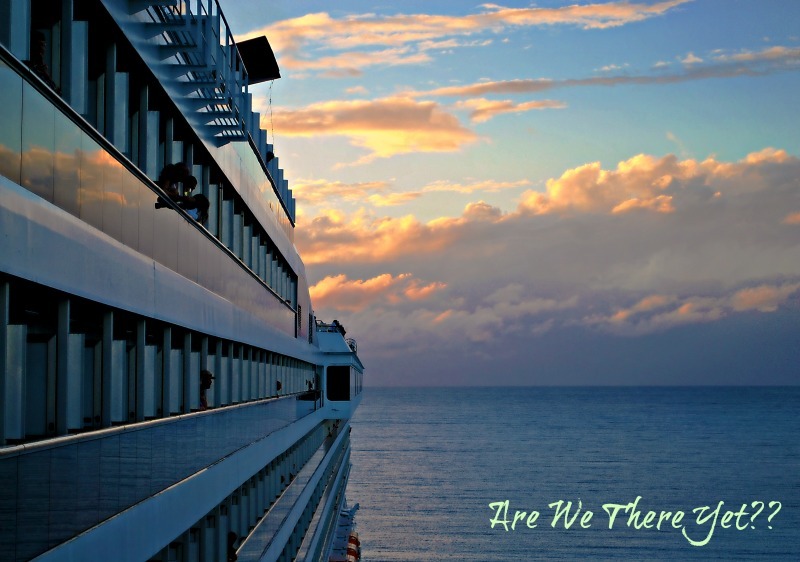 I hope they will be made right in time. As for the people of Vermont. Well there are the takers and the whiners and then there are the movers and shakers that do roll up their sleeves and get the job done. One depends on the government for everything and the others can take care of themselves. Just saying. the lost bridges are tragic for sure but the people of vermont rock! unlike another hurricane i remember where they all became victims and lived in gov't trailers for years. So very sad about the bridges. They are an integral part of Vermont's local fabric. I talked to my stepsister and luckily, her place in Quechee is okay. Thankful for that. There will be a lot of rebuilding to do in that state where so much history is built near waterways of one kind or another. I hope they do it is such a way as to retain the character of the region.